“If I have to cast it up – we saw I had to do that last year – I cast up my foot for the last half of the year. If we have to do it, I’ll do it.” — Ben, after today’s game. Ben had X-ray taken of his left foot after the game and is expected to have an MRI. He said the injury occurred on the second-to-last series when he was tackled from behind. He remained in the game but had trouble walking afterward in the locker room. Ben told the media that it’s too early to tell if he will be able to play next Sunday when the Tennessee Titans come to Heinz Field. But he isn’t pushing the panic button. He had plenty of company in the injury department today – Aaron Smith, Rashard Mendenhall, Jason Worilds, and James Harrison were also sidelined in the loss. Roethlisberger limped into the locker room about 20 minutes after the game with his arms draped around a pair of Steelers employees and an ace bandage and a bag of ice wrapped around his injured foot. He sat alone at his chair with his head down and looked to be gazing at his foot for several minutes before putting on the walking boot to limp to the showers. The Steelers were without two regular starters on the offensive line Sunday. 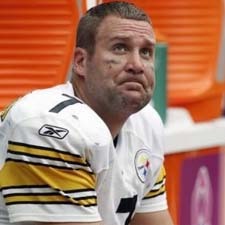 Roethlisberger has now been sacked 14 times this season and hurried 22 other times. Still, he didn’t blame Sunday’s problems on his line. You can watch video of Ben’s post-game interview here or read his comments here. Ben’s MRI today on his left foot showed no broken bones. The foot is still somewhat swollen and sore. There is not word on whether Ben will be available for Sunday’s game yet.